Get the professional, stable, uniform loads you’re looking for with the Wulftec SMHPA-200. This fully-automatic turntable stretch wrapper cuts down on film and labor costs while improving the overall safety of your packaging line. Not only is the high-profile base ideal for easier forklift access, it effortlessly takes on heavier pallet loads with even weight distribution. You can install this machine in-line, at the end of the line or as a standalone configuration. No matter your operational requirements, Hughes can help customize your SMLCA-277 to the unique needs of your packaging line. 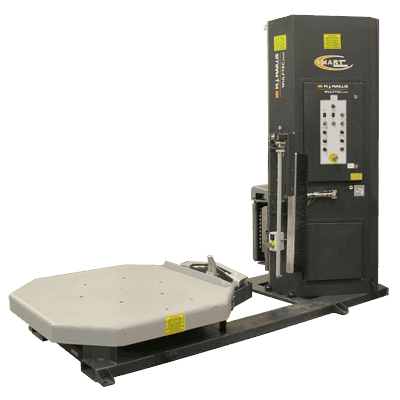 To learn more about the Wulftec SMHPA-200 Automatic Turntable Stretch Wrapper, give us a call at (609) 337-3641 or request a quote online. Never wonder who to call when downtime strikes. Hughes Enterprises is an essential part of your operations team, delivering 24/7 maintenance and support. Contact our factory certified support technicians for your installation, maintenance or emergency service requests. We’re here whenever you need us.